Chandler’s unique new mic and preamp combo boasts a kinship with some of the most prestigious names in recording: Abbey Road Studios and EMI. American manufacturers Chandler Limited are well known for a product line-up that focuses on vintage designs that have been subtly but intelligently enhanced for modern workflows. In particular, the company’s strong association with Abbey Road Studios enables it to bring re-engineered classic hardware from EMI’s hey-days to the market, of which I’ve reviewed many. Of specific relevance here, though, is Chandler’s take on EMI’s REDD.47 mic preamp, which I reviewed in SOS December 2015 issue. In case you were wondering, the REDD acronym stands for ‘Record Engineering Development Department’, and EMI’s REDD.47 preamp was an in-house modular valve unit intended to supersede the expensive Telefunken/Siemens V72S preamp modules. These formed the active core of EMI’s early mixing consoles like the REDD.17 and REDD.37. The REDD.47 module populated the company’s REDD.51 consoles, which were installed in Abbey Road’s Studio 3 (from late 1963) and Studio 2 (a year later). These consoles remained in daily use until mid 1968, when EMI’s solid-state TG-series consoles were introduced. Consequently, it’s probably fair to say that the REDD.47 preamp shaped the sound character of many of EMI’s classic recordings throughout the 1960s, including a great many of the Beatles’ definitive recordings. So, why am I mentioning this distinguished vintage valve preamp in a microphone review? Well, because Chandler have taken the REDD.47 preamp design and shoe-horned it into the body of their very first large-diaphragm capacitor microphone, which is quite a unique and intriguing idea. At first sight, you might form the impression that this new microphone is some kind of U47 clone, but that’s really not the case. 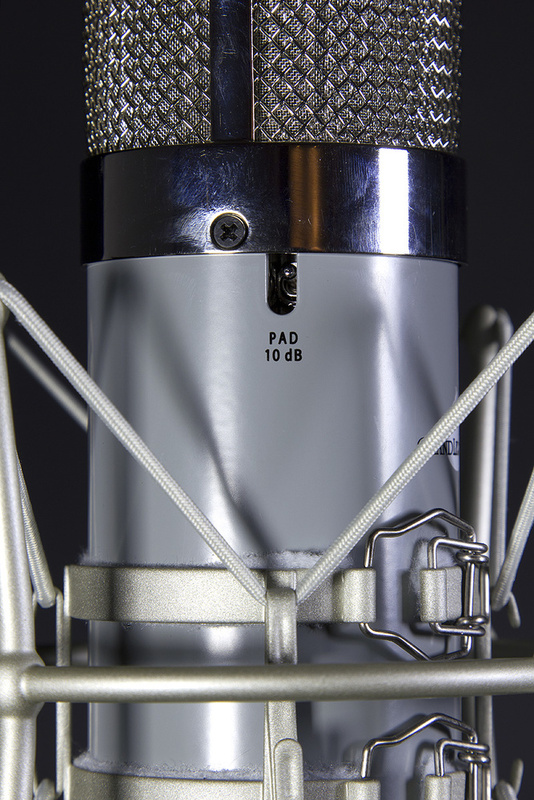 Chandler claim that their new REDD Microphone is the first new EMI-badged mic in well over 50 years, and in fact the REDD Microphone is neither a clone nor an homage of any specific vintage mic. Although its sonic character certainly shares traits with some classic vintage mics, it really does have a distinct and individual sound all of its own, as well as several rather unique features and facilities. As a fully integrated mic preamp it provides a balanced line-level analogue output, and so can be plugged directly into a recorder, a computer interface’s line input, or a standard A-D converter. 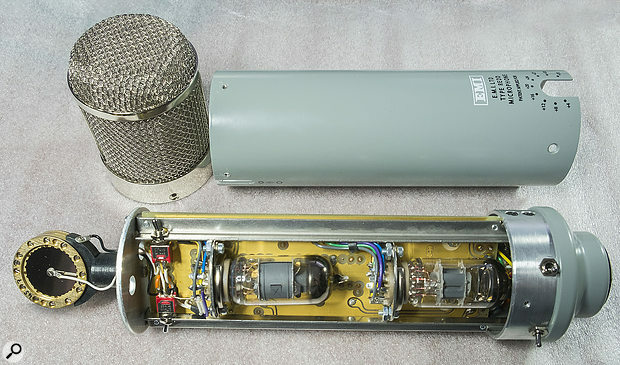 The microphone capsule is a custom-built and hand-made European (not Chinese) unit and, as already mentioned, the internal preamp circuitry is derived directly from that in the REDD.47. This means that the mic employs two valves instead of the single device found in most tube microphones, and that goes some way to explaining its size and warmth (both sonic and physical!). During the mic’s development, Goeke worked closely with Abbey Road’s former Chief Engineer, Peter Cobbin, and the REDD Microphone was compared and honed carefully against a wide selection of the classic vintage microphones from Abbey Road’s extraordinary collection to create a genuine ‘all-rounder’ of a microphone. Chandler recommends the REDD Microphone for diverse sources such as vocals, strings, piano, drums, bass guitar, and both electric and acoustic guitars. The preamp gain is adjusted on the microphone itself, up to a maximum of +33dB.Although an integrated mic preamp, some of the REDD Microphone’s facilities are very familiar — such as a pair of toggle switches selecting omni or cardioid polar patterns, and introducing a 10dB pad. But other switches are rather less natural accoutrements on a mic, such as the gain knob, and drive and signal polarity switches. 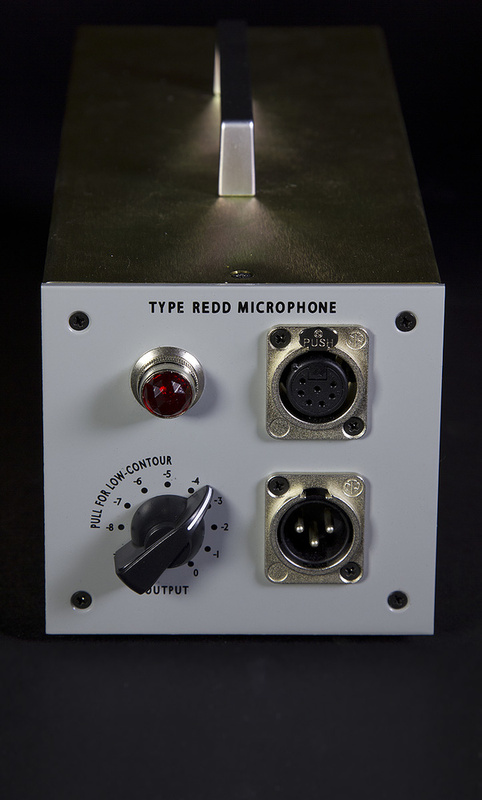 Not surprisingly, the REDD Microphone is powered from a dedicated mains power unit, but another unusual feature is that it carries a rotary fader on its front panel to attenuate the preamp’s line signal, if required. In combination with the gain control on the mic itself, these facilities allow the REDD Microphone to be used as a conventional mic, and to be connected to a traditional mic preamp, if preferred. 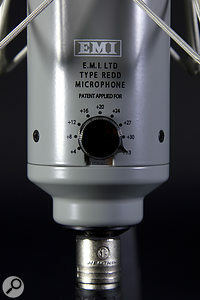 As with all of EMI’s original valve-era equipment designs, the output impedance of the REDD Microphone is 200Ω — a value which works equally well with both line and mic preamp inputs. This output fader knob also has a pull-switch action that introduces a ‘Low-Contour’ EQ, emphasising the high end a little and reducing the low end for an “alternative sound character”. This spectral shaping can also be used to reduce the impact of the mic’s proximity effect when used in cardioid pattern with close-miked sources. In a normal capacitor mic the capsule’s stored electrical charge is isolated from the outside world with an impedance-conversion circuit. This is usually built around a single valve or FET, the output from which normally feeds some form of output driver stage and/or a transformer, to send a mic-level signal down a mic cable to a separate preamp. However, the REDD Microphone avoids that low-level transmission path by integrating the impedance converter and preamp gain stage and, to achieve that, the front end of the REDD.47 preamp’s circuit has been redeployed as the mic’s impedance converter. That circuit revision means the REDD.47’s input transformer has been omitted and so the ‘free’ 15-20 dB of voltage gain typically provided by the transformer is also lost. Consequently, the gain range available from the integrated preamp stage is different from that in the REDD.47 rackmount preamp and, whereas the outboard preamp offers seven gain settings between 16 and 52 dB, the REDD Microphone boasts nine options but across a slightly smaller and lower range. In this incarnation the minimum gain is +4dB and the maximum +33dB, with 4dB increments up to +24dB, and 3dB steps above. Goeke told me that this 33dB figure is the maximum gain that he could extract while sticking as closely as possible to the original circuitry and preserving the REDD.47’s classic tonality. The microphone also features switches for engaging the Drive circuitry, inverting the output polarity, selecting between cardioid and omnidirectional polar patterns, and engaging the 10dB pad.Another deviation from the rackmount preamp can be found in the Norm/Drive switch, which replaces the ‘Fine’ gain control on the hardware preamp. The Drive mode essentially corresponds to the Fine control being in the fully on position, and in this condition the overall gain is increased by another 3dB (to a maximum of around +36dB) to impart a little more ‘punch’ to the sound while also swelling the amount of musically enhancing harmonic distortion. Don’t mistake this feature as a one-size-fits-all option, though; the strength of the Drive coloration can be tuned by adjusting the preamp gain and, as a result, it is a usefully versatile facility allowing the user to dial in the exact degree of musical colour and character required. 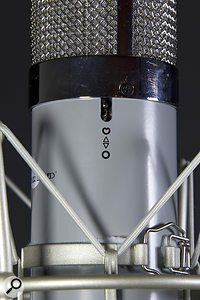 The microphone capsule is a dual-diaphragm, centre-terminated element, and looks to be modelled closely on the Neumann K67 design, except that its six-micron membranes are metallised with platinum rather than gold. Chandler Ltd say they buy the capsules from a European manufacturer, but they’re not saying exactly who makes them, only that each one costs around $500! The capsule sits in a rubber cradle mount to provide some internal shock isolation, and it is illuminated by a red LED which shines through a hole in the base plate below the capsule to indicate when the mic is powered. My reading of the handbook is that it implies this LED shines on the front of the capsule, but in the review sample it was definitely at the rear. Accessing the mic’s internals to change a valve involves the removal of three small screws to release the grille, and then another three for the body sleeve, which, unusually, slips over the capsule. Inside is a single high-quality PCB with gold-plated circuit traces mounted on a pair of supporting rails running the full length of the body. Two valves are suspended in tight-fitting valve holders on one side of the board, with the valve tops pointing in the direction of the cable connector. Standard through-hole components are mounted on the other side of the circuit board, in a similar quantity to that seen inside the REDD.47 rackmount preamp, along with a compact output transformer near the base of the mic body. I presume the valves are the same EF86 pentode input stage and E88CC dual-triode output stage combination, but they aren’t marked and Goeke is keeping pretty tight-lipped about the design details while the patent is pending. 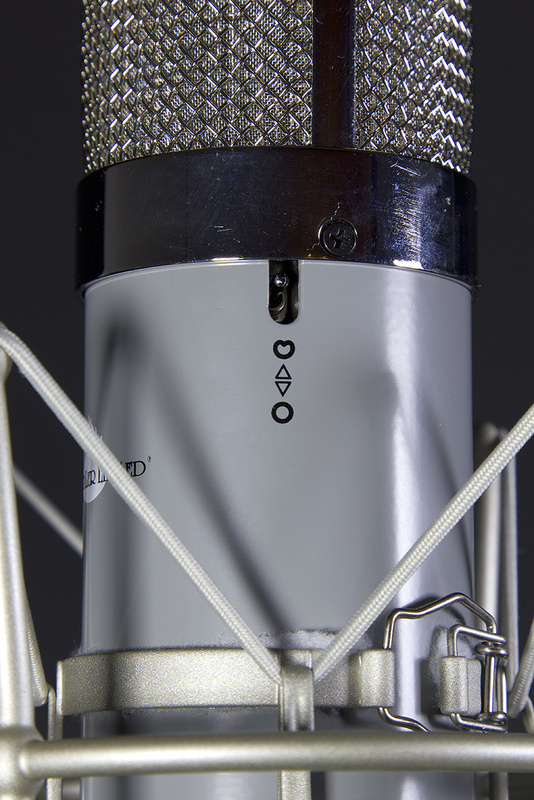 The electronics are all assembled in Chandler’s factory in America, and a serial number is hand-etched onto the frame at the base of the mic, with the same serial number carried on a label at the rear of the power supply. The inside of the microphone, with both valves visible (the output transformer is on the other side of the PCB). Upon opening the large cardboard shipping carton, I found the mic and its accessories were protected within a substantial Peli-style plastic case measuring 555 x 211 x 428 mm. A custom-moulded high-density foam interior protects the contents, and the whole caboodle weighs around 9kg. Packed inside the case are a cat’s-cradle shockmount with a 5/8-inch stand fitting (but no 3/8-inch thread adapter), a 7.5m (25-foot) Mogami (Neglex 3172) microphone cable fitted with seven-pin Neutrik XLRs, a custom mains power unit, a miniature screwdriver, and the microphone itself. Unusually, the mic is slotted directly into the moulded foam, rather than protected in a separate wooden box like so many competitors’ valve mic kits. However, the mic is protected from dust and moisture by both an overall clear plastic cover and a separate shorter plastic sleeve, which can be used to protect the capsule head between sessions. Moreover, the case itself has excellent hermetic seals too. The power unit measures 290 x 102 x 122 mm and weighs 2.3kg, with a fixed metal handle on the top. The attractive anodised steel case shimmers a golden-green hue, and the rear panel features a fuse holder, a large on/off toggle switch, and an IEC mains inlet socket. The power supply is hard-wired at the factory for either 120 or 240 V AC operation to suit the sales region. Internally, the power supply is a conventional linear design with both solid-state rectification and regulation, and the circuitry and wiring are constructed to a good standard. Just below the grille on either side are two recessed toggle switches, which select the polar pattern (omni or cardioid) and a 10dB pad (shown below).Moving around to the front panel, this is finished in standard EMI ‘battleship’ grey, with a red jewelled power light, seven-pin mic XLR connector, and three-pin (line-level) output XLR. The combined output fader and LF Contour control features a chicken-head knob to look suitably vintage, but the bulbous shape makes the pull-switch operation a little trickier than might be expected! I quickly found, though, that grasping the tail of the knob between finger and thumb gives sufficient purchase to operate the LF Contour pull-switch. Turning to the mic itself, this is a pretty large beast at 62mm in diameter and 278mm long, and it weighs 0.5kg. 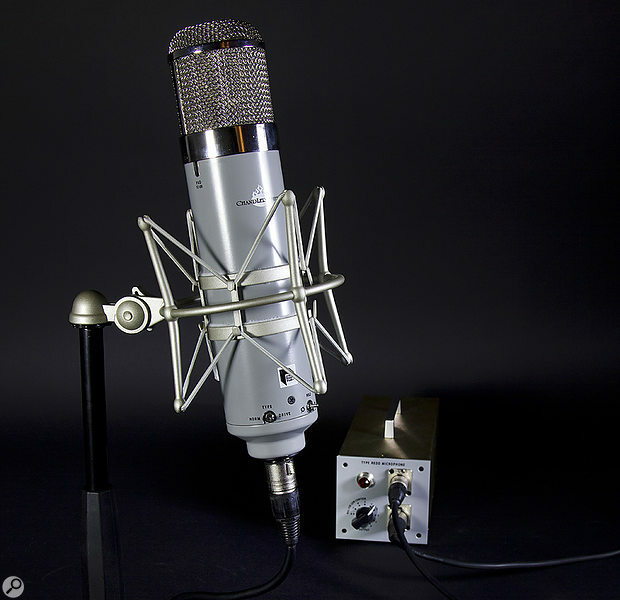 The overall style is unquestionably reminiscent of the Neumann U47, with a grey-painted cylindrical body and large multi-layered domed and chromed grille. Just below the grille on either side are two recessed toggle switches, which select the polar pattern (omni or cardioid) and a 10dB pad, but these are recessed so well that a tool of some kind is required to change them. Helpfully, Chandler include a miniature screwdriver for just such a purpose! In something of a styling contradiction, the three switches at the base of the microphone stand abruptly proud of the body sleeve, and may be prone to accidental damage as a result. The presence of these protruding switches also means that the mic can only be installed into the shockmount grille first — and it is quite a tight fit. The two toggle switches on the front at the bottom of the body sleeve select the Norm/Drive mode and output polarity (labelled ‘Pole’), while a rotary switch at the rear adjusts the internal preamp gain with a small pointer-knob indicating the current setting. 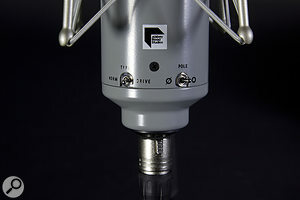 Corporate logos for both Chandler Limited and Abbey Road identify the front of the mic, while an attractive vintage EMI logo sits above the gain control at the rear. This is an unusual product, and a pretty expensive one, of course — although the cost is ameliorated by the fact that this is both a high-end valve mic and a classic valve preamp, all in one. In America the REDD Microphone costs almost twice as much as its rackmount REDD.47 preamp sibling, and that suggests Chandler Ltd values the mic element at around £2000 — which I think is a pretty fair assessment. My initial listening tests revealed a deliciously smooth and full sound character, which seems to combine both the body, weight and warmth that might be associated with a vintage Neumann, while also delivering the kind of open, airy and creamy top end that might come from something like a Telefunken ELA M251. Overall, it’s a very well-balanced sound, with a wonderfully clear and informative mid-range, which I quickly found became quite enthralling on all voices. Having said that, the mic is also quite neutral enough to work well on a wide variety of other musical sources, and Chandler’s claim that this is a good all-rounder seem completely valid to me. However, not only does the mic sound warm, it gets quite warm too — a fact which isn’t particularly surprising when you consider that it incorporates twice as many valves as most other tube microphones. My infra-red thermometer measured the outside of the mic body at 34 degrees C after an hour of use, and an estimate of the internal temperature (measured through one of the switch recesses) was over 40C, so in use the mic would probably benefit from being suspended upside down, where practical (see ‘Upside Down?’ Box). When testing the mic with spoken-word sources I found the 33dB maximum preamp gain (under the Normal mode) was often insufficient to deliver ideal signal levels into an A-D converter calibrated with a +24dBu peak level (SMPTE standard). I was typically getting signal peaks around -20dBFS which, although perfectly usable, is lower than I’d like. For converters aligned to the EBU standard (0dBFS = +18dBu) the typical digital level would be 6dB higher of course, but that’s still a way below the -10dBFS peaks I’d usually be aiming for. Thankfully, in situations with quiet sources where more gain is required, many line inputs can add another 5-10 dB easily enough, or the microphone gain can be turned down and the mic connected to a conventional mic preamp instead. I didn’t notice any significant noise penalty in taking this approach. Having said that, I had absolutely no level problems at all when using the mic on sung vocals or most instrumental recording situations (including moderately close-miked acoustic guitar). Moreover, in applications where some added colour was appropriate I found it quite easy to crank up the internal preamp gain with the Drive mode active, while backing off the output fader, to achieve precise control of both the amount of harmonic richness and grit, and the recorded peak level. The chicken-head-style knob on the PSU is an output level control, and also actuates the Low-Contour frequency shaping.The Low-Contour facility, controlled from the power supply, can be surprisingly subtle on some sources, but night-and-day obvious with others. When engaged, it applies a relatively gentle tilt to the frequency response, thinning out the low-end a little — giving the impression of a tighter and more solid bass — while simultaneously seeming to pull the mid-range and high end forward slightly to boost the sense of presence and overall energy in the sound. It’s a facility that is certainly useful to have, and I found it quite beneficial on some electric guitar tracking and some male vocals. Taken purely as a valve mic, Chandler’s new REDD Microphone is very impressive, delivering a delicious vintage character that somehow also conveys a modern presence and clarity, with acceptably low noise and an artist’s ego-swelling visual impact! 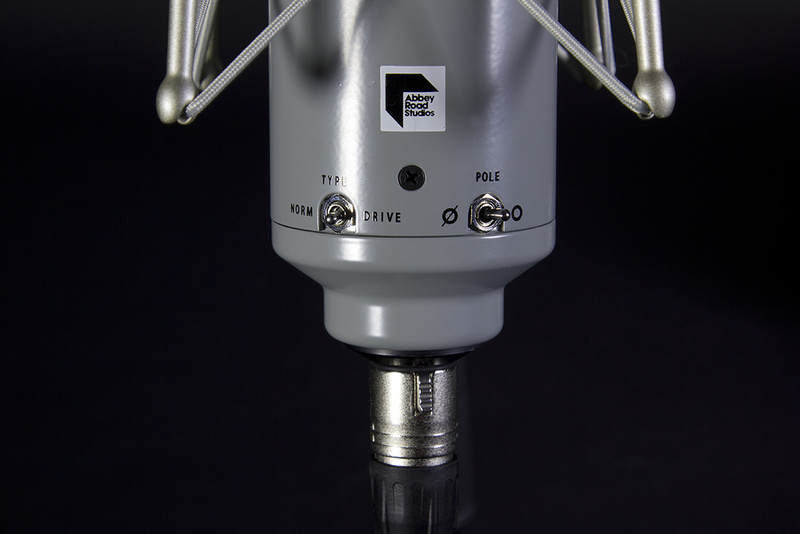 It is also pleasingly versatile, thanks to its selectable omni or cardioid polar patterns, and if Chandler released a version of this mic with a simple valve impedance converter and no preamp I’m certain it would do very well own its own merits. However, that option isn’t available (yet? 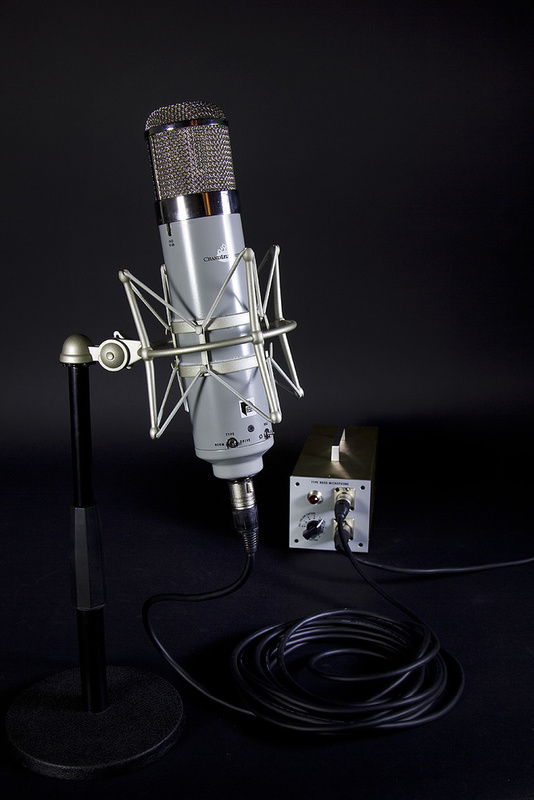 ), and the REDD Microphone’s unique selling point is its cleverly integrated REDD.47 preamp circuitry. That unusual enhancement brings the twin benefits of the versatile Drive mode coloration, and the option of a line-level output — but while the former is most excellent, some potential purchasers might have doubts over being tied to one specific preamp, which might seem limiting compared with the more traditional approach of carefully selecting different preamps for different applications. Of course, this practice wasn’t easily available to Abbey Road’s engineers in the 1960s and they seemed to do pretty well using the REDD.47s on everything! 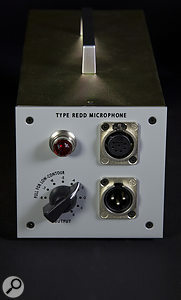 For those with direct line-level access to their DAW’s converters and who specifically want to avoid additional gain stages, the REDD Microphone offers an ideal solution, and although many computer interfaces attenuate line signals before passing them through their own solid-state mic preamps, the REDD Microphone brings the option of introducing some valve colour when recording. 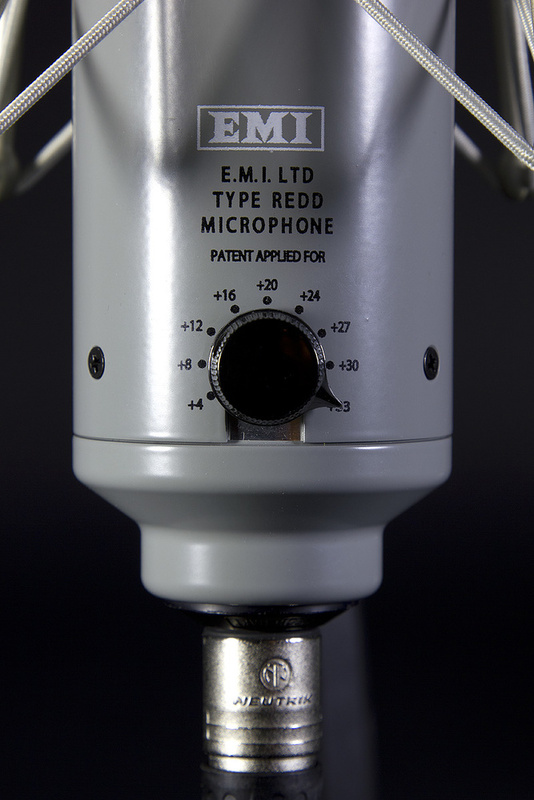 As far as I’m aware, there are no other tube microphones with a built-in adjustable valve preamp, and certainly none that can claim the heritage associated with EMI’s REDD.47! However, in terms of comparable quality I feel confident in suggesting that the REDD Microphone easily holds its own against any of the high-end vintage mic clones and homage competition, teamed with any vintage preamp. There are many myths about the practice of mounting valve microphones upside down, but for me the primary reasons for this popular technique are entirely practical. Most applications for this approach to mic rigging involve vocal recording, and in that situation it is usually beneficial to keep the mic stand well away from the singer, so they can’t grab or kick it! Suspending the mic from above on a boom stand achieves that goal very neatly. It also leaves a clear space below the mic for a vocalist’s music stand, and/or a table with a glass of water, and with appropriate mic positioning the overhead arrangement also encourages the singer to stand up straight and tilt the head back slightly, which helps to open the throat and chest. Of course, all of these pragmatic benefits apply whatever the mic technology in use, but there are some important additional returns when using valve mics. The significant difference between valve and solid-state mics is that the former tend to get warm, and warm air naturally rises. So suspending the valve mic upside down is helpful in guiding the convectional warm air currents away from both the delicate capsule and the internal electronics, both of which are well known to suffer reducing lifetimes as the ambient temperature rises. Rising air can also become turbulent as it passes over obstructions, generating unwanted acoustic noise, so mounting the mic with the capsule at the bottom avoids this potential problem. Keeping warm air away from the capsule also reduces the risk of the diaphragm material degrading (or even expanding and losing tension) due to elevated temperatures. The risk to the internal electronics mainly concerns the effect of heat on electrolytic capacitors — of which there are two inside the REDD Microphone — as they really don’t fare well under extended elevated operating temperatures and become far more likely to fail early in their life expectancy. Unfortunately I couldn’t see the temperature rating printed on the electrolytic capacitors inside the REDD Microphone, but Wade Goeke is a good electronics designer and I’m sure he has specified appropriate components. Classic REDD.47 preamp sonics and musical versatility. Controllable Drive for coloration options. Adjustable mic- or line-level output. European capsule design and American mic assembly. High-quality protective case and accessories. Recessed switches can only be altered with a suitable tool (provided). Heat may be a concern for some. An inspired integration of traditional capacitor mic and classic vintage valve preamp to create a fabulous-sounding and unusually versatile studio microphone.